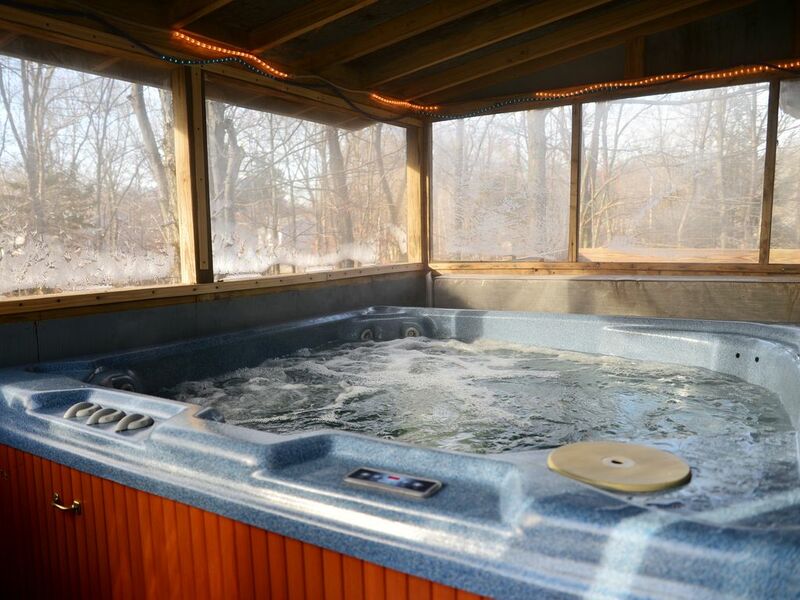 Our home features a spectacular, new hot tub on a second story secluded deck which is fully enclosed. It has 26 jets, a waterfall and a 6 person capacity. We offer spotlessly clean & well maintained accommodations. This large & climate controlled home is situated on a wooded, one third of an acre. It comes with two large decks. We also feature a spacious living room area, which has a breath taking 16' fireplace & a very impressive entertainment center. The area offers a snowmobile park, 4 riding stables (2 offer sleigh rides), 5 golf courses, & 3 state parks. The night life & dining is superb with Caesar's, Pocono Brewing Company and Bailey's close by. "Camelback" is nearby for sking, snowboarding and tubing. In the summer they offer a exciting water park. Our MISSION is: "To provide the most comfortable and clean atmosphere where families, friends, and couples can spend quality time and foster memories."